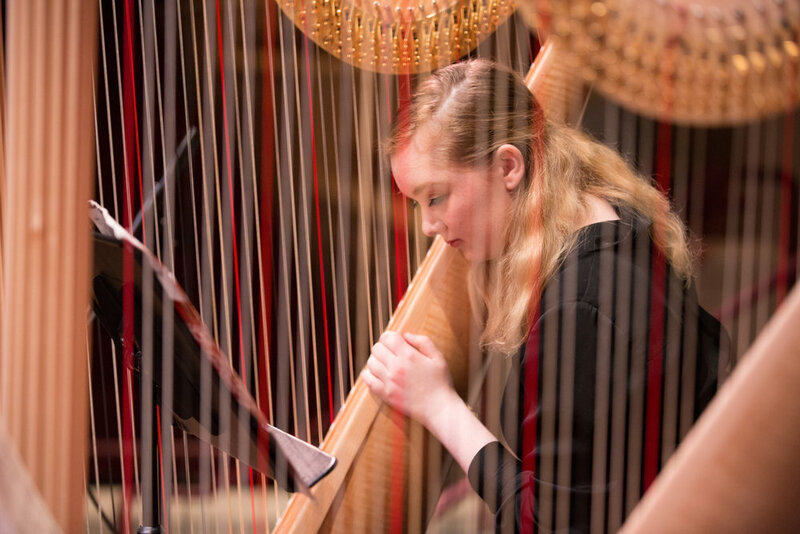 Under the expert direction of Elizabeth Blakeslee, the harp ensemble rehearses weekly on Mondays from 6:30-8:00 and will perform several times a year. Its repertoire will include arrangements for harp ensemble as well as original works. Any harpist who has had at least one year of private instruction and plays on an instrument with a minimum of 34 strings with a full set of levers is invited to audition. Within the program, AYPO will provide two different tracks for harpists of different skill levels. Please apply to the AYPO Harp Ensemble using the application form. Applicants will be asked to play a solo of your choice (between 2-5 minutes) and to sight-read. Applications for the 2018-2019 season are due by May 15th, 2018. Live auditions will be held the weekend of June 8-10. Please apply to one of AYPO’s orchestras as a harpist using the standard audition application [here]. Symphonic harpists will be accepted into the program as members of AYPO as a whole rather than as members of a specific orchestra. These musicians may be asked to play with AYCO, AYSO, and AYP over the course of the season as schedules and the repertoire of the season demand. In addition, these musicians will take part in master classes and group coachings and be members of the Harp Ensemble. Symphonic harpists will also be eligible to audition for the Chamber Ensemble Program and, if accepted, will be invited to participate in that program for an additional $250. If you apply for an AYPO orchestra and are not accepted, you may still be invited to join the AYPO Harp Ensemble.